We have just passed the 300 mark in regards to the number of students who have joined Koinonia Institute. This year has flown by and much of it has been spent preparing for our ''official launch,'' which is scheduled for mid-September. The following are the courses which will be starting online in September, along with a list of other courses slated for a November launch. Needless to say, we are ecstatic over what the Lord has done and are gearing up for what lies ahead. KI courses beginning in September: BIB 101, Old Testament Survey; BIB 102, New Testament Survey; BIB 103, Introduction to Hermeneutics; BIB 201, The Book of Genesis – Part 1; BIB 203, The Book of Daniel; BIB 204, The Book of Revelation – Part 1; BIB 206, The Book of Proverbs; PRO 101, Introduction to Prophecy; and SD 101, Introduction to Spiritual Disciplines. KI courses beginning in November: SD 102, The Way of Agape; BIB 207, The Book of James; BIB 208, The Book of Jude; BIB 209, The Book of Matthew - Part 1; BIB 210, The Book of Matthew - Part 2; BIB 210, The Book of Numbers; BIB 202, The Book of Genesis – Part 2; BIB 205, The Book of Revelation –Part 2; and, BIB 150, Biblical Cryptology. Here at KI we continue to be blessed with our partnership with Louisiana Baptist University and look forward to next May when more of our KI students will graduate from LBU with either their Bachelors, Masters or Ph.D. degrees. If you are unaware of what I am talking about, LBU accepts KI credits for up to half of the requirements necessary for all their degree programs. When you have successfully completed these courses, we ask you to share the vision of the Institute with a friend and get them to join our KI family. 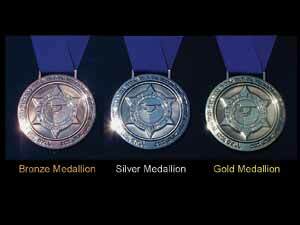 You then will have earned the first of three awards the Bronze Medallion! Following the Bronze, the next step is the Silver and then on to the Gold. Another thing that has become crystal clear to us is that KI is Small Group friendly. The pursuit of the Medallions can not only be pursued by the diligent individual but, because of the format and because of the Internet, groups of people are able to go online and pursue the Medallion Program together. Make sure to give us a call if this is something your group might want to pursue, and we will do whatever we can to assist your group. At the time of this writing, we are making the final corrections to both our Catalog and new Handbook. Our expectations would be to have both in ''hard copy'' as well as an ''electronic version'' available in a few weeks. For more information, or if you would like to register for a class, just go to www.studycenter.com. Words cannot express the deep feeling I have for our next sojourn to the Holy Land. October 24th will be here before you know it and that marks the maiden voyage for our Israel II trip - the first of its kind. I am literally crossing off the days on my calendar because I know that this will be a trip that will ''knock the socks off'' those who join us. This trip is geared for those who have been to Israel before and/or for those who have a deep love for Eretz Israel (The Land of Israel). Even if you have never been to Israel before, this is an experience you will want to have. 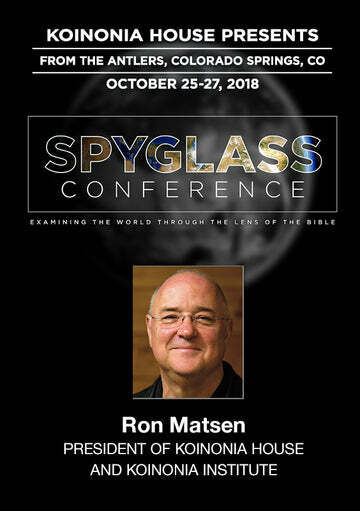 No doubt we will be taking in and experiencing many of the special places that are endearing to Christians, but along with that, the focus of this trip will be to give a birds-eye look into the Israel of to-day! This trip will visit (at a safe distance) the Southern, Northern and Eastern fronts and we will be briefed by experts from the IDF, Shin Bet, Mossad as well as representatives from the Knesset. This is definitely a ONE of a KIND trip! For more information and to see if we still have availability (this trip will be limited in numbers), please either email our Tour Department Administrator at sharon@khouse.org or call our toll-free number: 1-800-KHOUSE-1. 1st Annual Koinonia Institute Conference: Save the Date! At the time of this publication, KI is putting the final touches on its first National Conference which will, from this time on, be held up here in the Coeur dAlene area. The dates are set for November 17th-19th. Dr. Chuck Missler will be our keynote speaker but we also will have some ''surprise'' guests! The conference is open to all KI students. (If you are not currently a student, make sure to register for a course in order to gain admission.) For more information concerning pricing and updated conference details, go to our website at www.studycenter.com. 5. The Command of Circumcision: Let me just say that this rite was new. Can you imagine the shock that Abraham must have felt as God described the details of what He was asking Abraham to do? Needless to say, Abraham was obedient! 6. Abimelechs abduction of Sara. 7. His marriage to Hagar after having despaired that Sarah would ever give birth. 8. Driving Hagar away after she had given birth. 9. The very distasteful command to drive Ishmael away. These four trials I have lumped together because they have a common thread, which has to do with dealing with failure. In college I had a class that required me to attend theatrical events and critique them. Because of that assignment I attended a play at the Old Globe (which I remember nothing about) whose title has stayed with me to this day. It is this title that comes to mind as I describe the above trails of Abraham - Surely the Runner Stumbles. One thing that I know is that no matter how hard I try, I am going to stumble in my walk with Christ. The question is what do I do when I realize I have made a mistake, that I missed the mark, that I fell short of what Gods best was for me? Abraham gives us the example that we should follow. He doesnt pout; he looks disappointment square in the eye and does what is required, no matter how difficult that might be! As Christians we know that we all will stumble but remember the proverb that states that a righteous man may fall seven times - but he gets up! When you stumble, get up and DO THE RIGHT THING! God is a God of redemption - He can take the things that are broken and heal them, but we must do our part! Abraham did his part, which added to his legacy as the Father of Faith. 10. The binding of Isaac on the altar. What a fitting conclusion - The Akedah! I am at a loss for words when I try to convey the majesty of this event. An event that is a remez (a pattern) of prophecy that paints a picture of a Father who takes his beloved son and is prepared to offer him as a sacrifice. Abrahams hand was stayed and Isaac was returned. Gods hand, however, was not stayed, and because of Jesus death, we too can return to our Father and be forever united! Thank You Jesus!